On 2 November 2012 my life changed forever when my Dad sadly passed away following the diagnosis of a very rare brain tumor. He was a massive part of my life and as he was only 69. It was not something I imagined I would have to cope with for some time; especially since his father and grandfather both lived to the ripe old age of 91. St Francis Hospice cared for him and helped us during the very difficult last few weeks of October and so my brother and I decided to run the Virgin London Marathon in April 2013 and we have just signed up to run again! 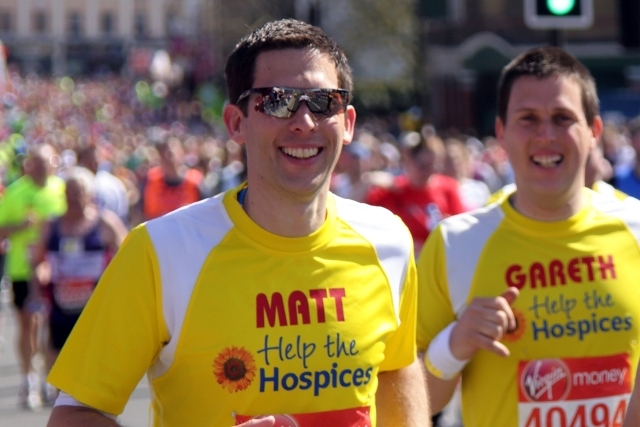 Help the Hospices is the national charity for hospice care and directly supports 220 hospices across the UK. Each year over 360,000 adults and children, as well as their families, are cared for and supported by their local hospice. The care received in hospices is personalised to suit the individual's needs. Help the Hospices acts as the voice of local hospices with government and the NHS, they help hospice staff to keep their skills up to date by providing training and education and they provide grants and direct funding to support hospices with caring for patients and their families. Spending some time with the team made me realise what great work this charity does and I am honoured to have made such a significant contribution in memory of my Dad. We managed to raise £9,000 excluding Gift Aid for Help the Hospices in 2013 through a combination of sponsorship and holding events such a quiz night and cake sales. I also received matched funding from my employer which was a great way to boost the total raised. I have been truly overwhelmed by the support and donations we received. I began training and gave up alcohol on 1 January 2013. My first 5 mile run around the Isle of Dogs in temperatures barely above freezing was one of the hardest things I had ever done. My legs were heavy, I was struggling to breath, I tripped over a kerb stone and ran down a dead end! I stuck at it and the 5 mile runs got easier and I built up to 8, then 9 and then 10 miles. Starting to feel more confident I set off with Gareth early on Sunday 19 January to run from my home in Brentwood to Billericay and back, a total of 15 miles. Everything was going well until half way back at around 12 miles disaster struck, my left knee completely locked up and I was in agony. I was banned for running for 6 weeks and sent to the gym to do strengthening. After a frustrating 6 weeks I was back running, although the knee still gave me some discomfort. I completed the marathon in 5 hours 5 minutes and 5 seconds - truly the hardest and most satisfying thing I have ever done. To anyone considering running a Marathon; it's a tough challenge - be under no illusion. However it is the most satisfying thing you will ever do and worth every effort you put in. The hardest part is training without ever having experienced race day, once you have experienced race day it makes it all worthwhile. When training, build up slowly. Combine running with strengthening exercises; you need strong hamstrings, quads and gluts for a marathon. Join a Running club or book a Personal training session at your gym to get a training plan suited to you. Good luck!